Manual. Written in LaTeX since I plan to include explanation of all the math here as well. For now it's only manual for the command line interface. Manual is included in distribution package. Cropping before stacking. Works on both GUI and CLI. This reduces amount of required memory and makes stacking a lot faster. Download the latest source package from BitBucket and follow the instructions included. Use Ubuntu's PPA https://launchpad.net/~mikko-laine/+archive/ubuntu/pyastrostack. This might work on some other distros derived from Ubuntu. Install from Gentoo-science overlay. Ebuild is renamed from pyAstroStack to mosstack. No, there's no new name. I didn't come up with anything. The name is now AstroStack and executable is astrostack with no CamelCase. I'll also change distribution package names and Gentoo and Ubuntu releases to lowercase. I'm also including a .desktop file so AstroStack will be found in the menu of desktop environments that support these files. My understanding is that they all should. A release candidate (RC3) is already uploaded in BitBucket and Launchpad. The program itself is working fine on RC3 (at least it seems so...), but lacks documentation, .desktop file has some problems and the icons are in wrong format. I hope I have enough time to finalize this on the weekend. Now that I go to work again after one year of child care leave, my time on this project is more limited. Frame information table on Gui. There's already a place holder for it but no functionality. Click a frame from the list and this should show all the extracted info. Setting for choosing memory limits for stacking. I have no idea how to limit by megabytes, but I can choose how many pieces the stack is split into. This could somehow depend on the setting. Show frame when clicked. Maybe as a pop up window. Choose the reference frame which the rest are aligned to. Choose cropping from the reference frame. This will save a lot of time and memory during the stacking process. The GUI of pyAstroStack works reasonably well (for such a limited gui that is...) in version 0.4, but my original plan was a little different. Now that I have time to code again after summer, I'm finally getting my vision to work. I want the list of files to be more interactive. 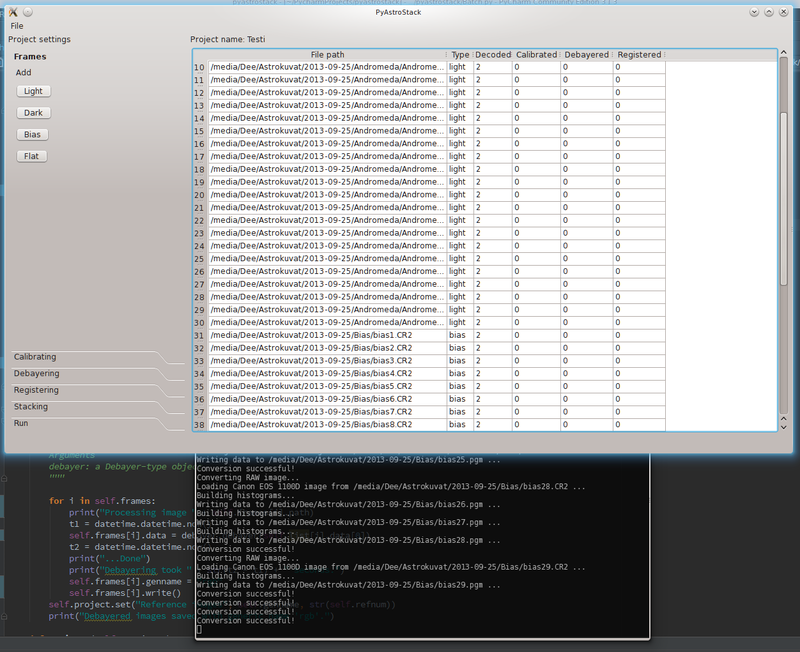 First column shows the file path, second is frame type, but the rest are what I'm working on. Decoded means reading the RAW file and decoding it to FITS. Numbers 0, 1 and 2 are place holders for "Not started", "Working..." and "Done". I'm not sure if I want some kind of icons or rolling animations there, but for now only the place holders. The moment you select some images and click OK, the program starts decoding them on background. Gui will be responsive all this time and you can select more files while it's working. You can also set parameters for full process while it's working on background. and everything started working. This might be obvious for more experienced PyQt programmers, so I can understand why no tutorial emphasized the importance of it. Maybe now I remember that all QWidgets require the parent as an argument. Decoding works with 5 simultaneous threads, but with 10 there are random errors. I wonder if the threads are trying to use same files at the same time. If so, it has to be fixed. The rest of the program is currently broken (on 0.5dev, on 0.4.1 it works of course) because I had to do significant changes to the frame handling to get multithreading to work. Installing with python setup.py install is fairly easy but taking care of the dependencies can sometimes be ugly. I always wanted this program to be easy to install and now that's happening; for Gentoo and newest Ubuntu 14.04. Most Gentoo users are familiar with layman, overlays and unmasking masked packages. For most, that's the reason to use Gentoo. Easy installation for almost everything. Stuff that isn't on Portage tree can be added for easy emerge with overlays and layman takes care of them. I wrote an ebuild for pyAstroStack and it was accepted in the science overlay. The --autounmask-write creates unmasking configurations and dispatch-conf or etc-update integrates them into /etc. This will install Python 2 and/or Python 3 versions according to your PYTHON_TARGETS variable in /etc/portage/make.conf. I know there's Launchpad and apt-repository for community packages but I'm not there yet. Maybe soon, but for now there's only a .deb file to download and install. 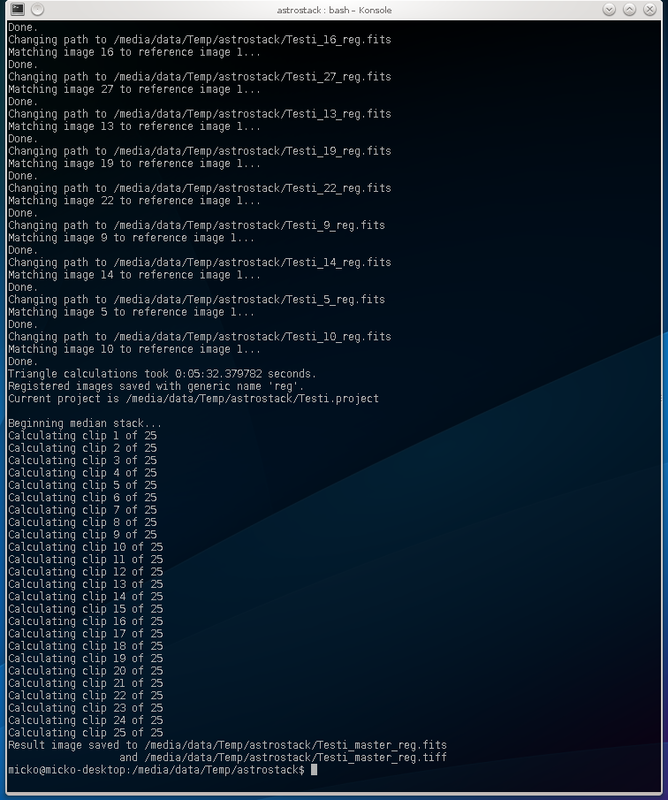 First line will mark the package to install but the installation will fail due to missing dependencies. Second line fixes all that and installs everything required including the software itself. Of course I'd like to support everything. The .deb I made does not necessarily require Ubuntu so it most likely will work on Mint and other Ubuntu derivatives. It also might work on Debian, but that's more uncertain. Debian specific package will be ready in near future. Python's distutils support creating RPM's but I haven't tested those at all so I will not distribute them. For everything else I recommend the python setup.py install line and manual installation of all the dependencies. I released 0.2.1 just about a week ago and now I'm about to push 0.2.5 out. First the updates were indeed minor, but they grew and became quite important considering the whole program. After finishing 0.2.5 and hunting down its bugs I decided this version should be 0.3.0 instead. Installation still requires Python-pip on Ubuntu 13.10, but I'm already targeting this on soon to be released 14.04. There might even be a deb-package or repository on Launchpad if I figure them out. Bilinear and Variable Number of Gradients (VNG ) debayering algorithms. This makes PyOpenCL not required. With OpenCL the methods are a bit faster but the difference is about 10-20%. 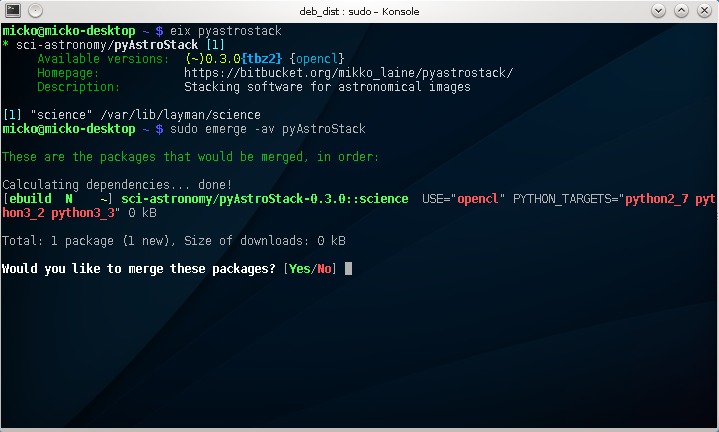 PyAstroStack will work on Ubuntu 14.04 without too much hassle. There are a lot of packages to install but everything seems to be on package manager. Fixed a huge memory leak on registering operations. Full list of changes in distribution package on in Git repository. First I have to say that this project was a lot bigger than I thought. Even on the limited functionality it has now there was a lot more work I was prepared to. And all that work was surprisingly mostly user interface and saving the temporary files. I'll write a bigger post on all the problems I ran into and let this post be the announcement of the first released version of pyAstroStack. 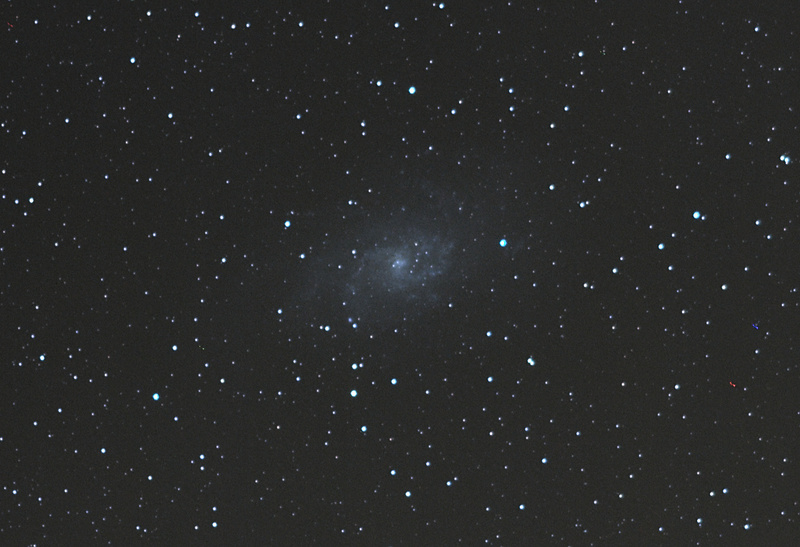 PyAstroStack is an open source stacking software for astronomical images taken with DSLR. This first version includes basic functionality such as subtracting and dividing images, debayering, registering and stacking. Supported image formats are limited to Canon EOS 1100D CR2 and similar. Don't expect anything spectacular. I'm not very experienced programmer. Here's an example image what pyAstroStack can do. 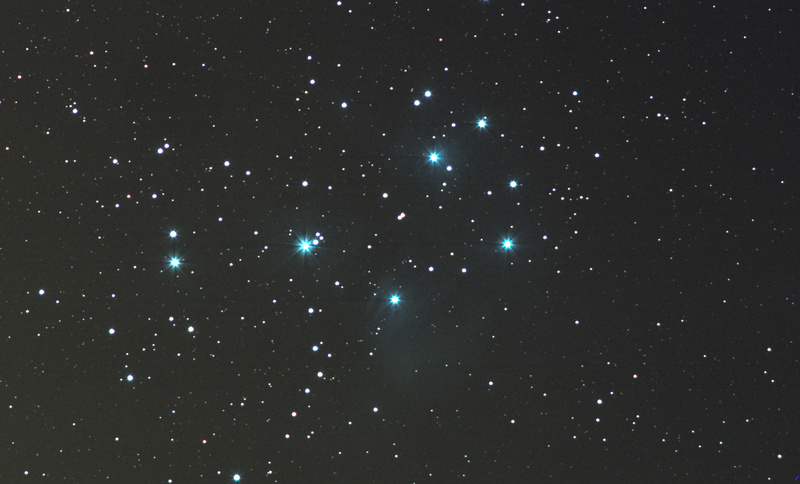 This is a median stack of about 30 exposures. Command line only. You really need to read the manual to use this. The software could really be user friendlier. Download and extract source package. See INSTALL.txt. I have only access to one camera. Also my data isn't too good, I'm aware of that. That of course limits my test runs. What I would really appreciate is some raw photo sets that allows me to run tests on different features. Set of some light frames and proper flat frames. I'm bad at taking flats whenever I even bother to take them. This has made it quite difficult to implement flat frame calibrations properly. Single example images from different cameras. This is just to make sure my program recognizes them and is able to debayer them properly. 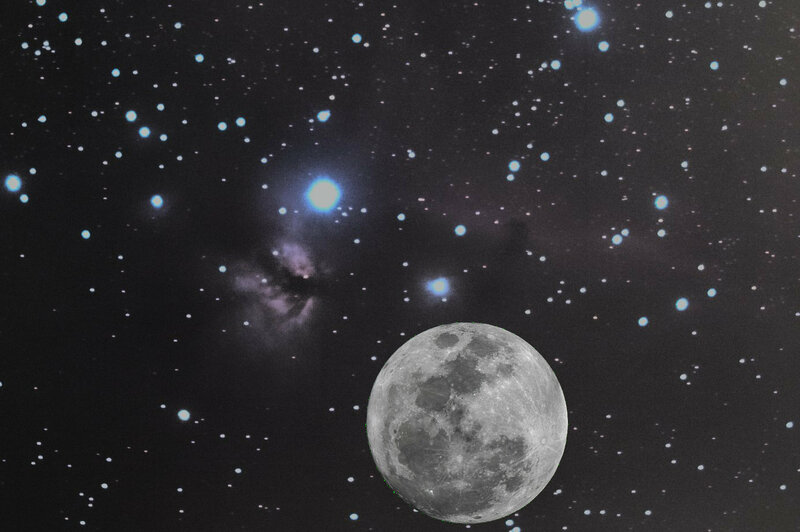 These images don't even have to be astronomical. Just something with recognizable colors. I wrote about this on some previous post, but I felt I'd have to get back to this. 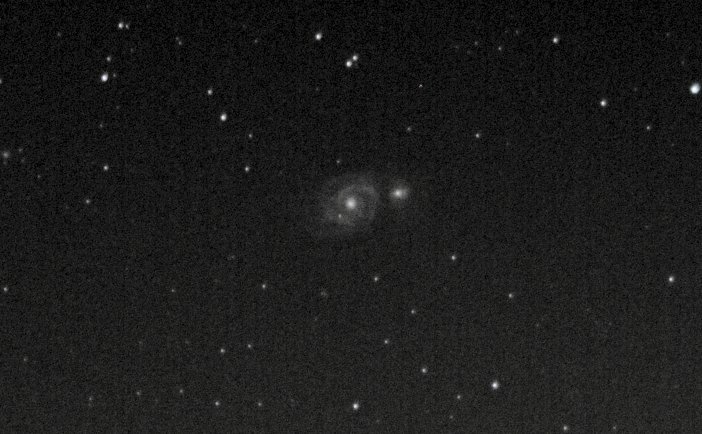 Most people, including me few years ago, don't realize how big all the galaxies and nebulae are in the sky. 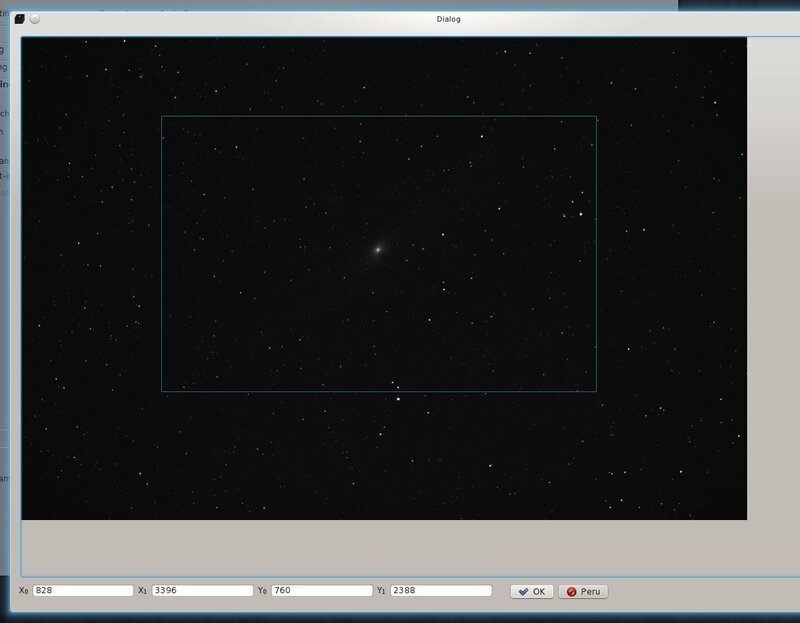 Most common example I've seen is the Andromeda galaxy. Even if you could see it with naked eye (I've understood it's possible), it won't be more than a tiny smudge. But you won't need much of a camera to capture a lot more of it. Then you're starting to realize. Here's a comparison of the Andromeda galaxy and the Moon. I took some photos of the Moon with a 200 mm lens, the same I use to photograph Andromeda. 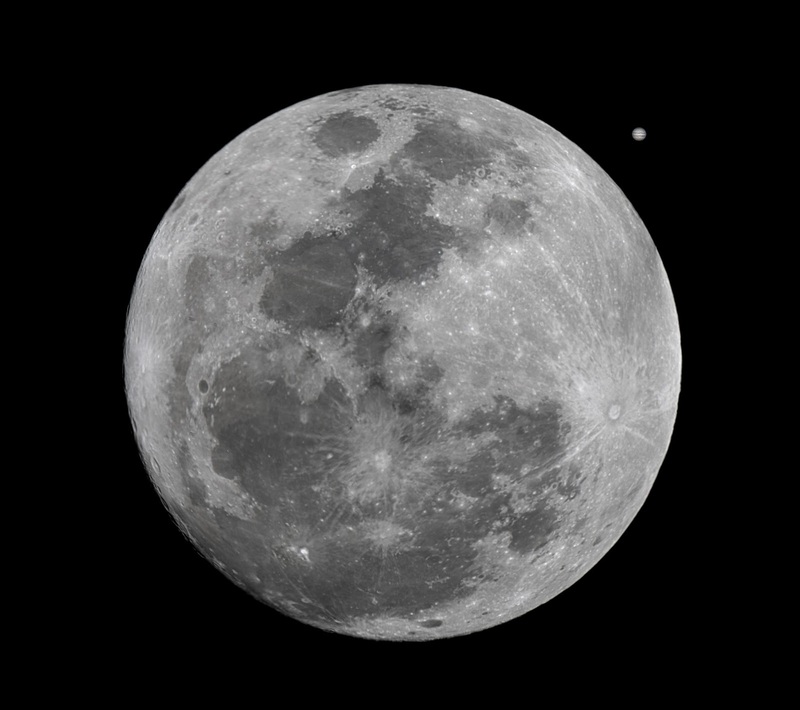 I then measured the size of the Moon and resampled a bigger photo (effective focal length 2400mm) to match that size. Resized Moon was then pasted next to Andromeda. Here's another. 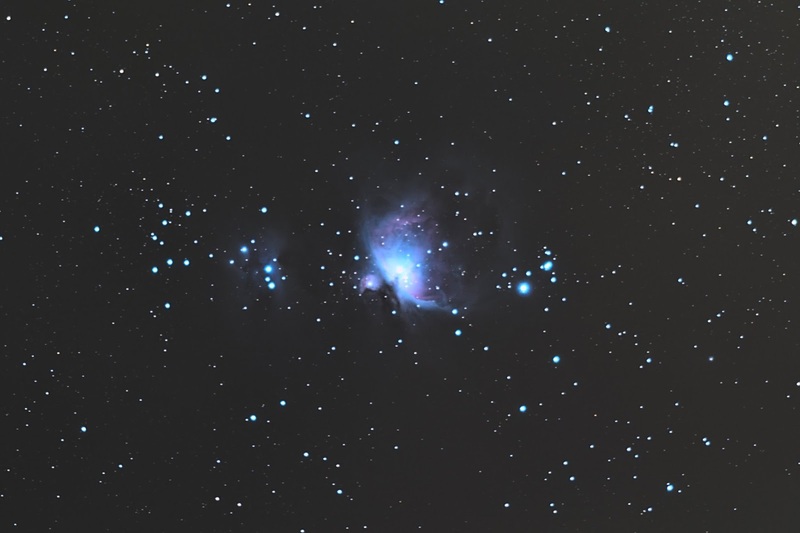 Great Orion Nebula M42 with the Moon placed next to it. 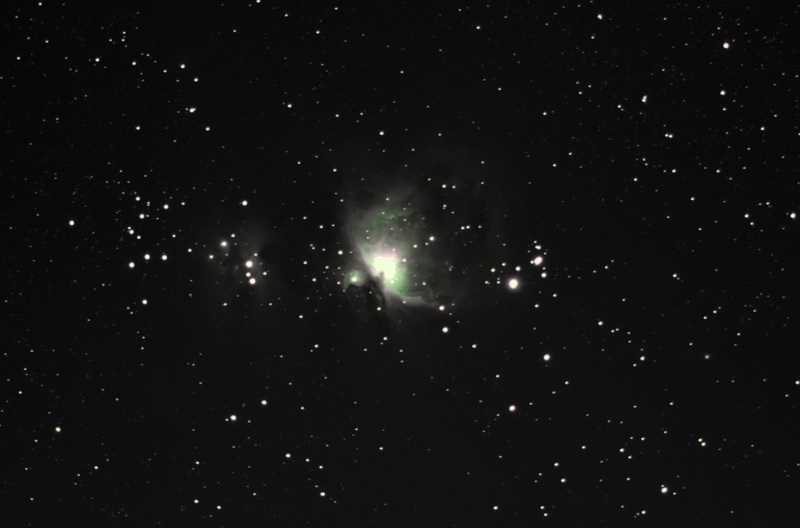 M42 is actually visible without any equipment almost everywhere. 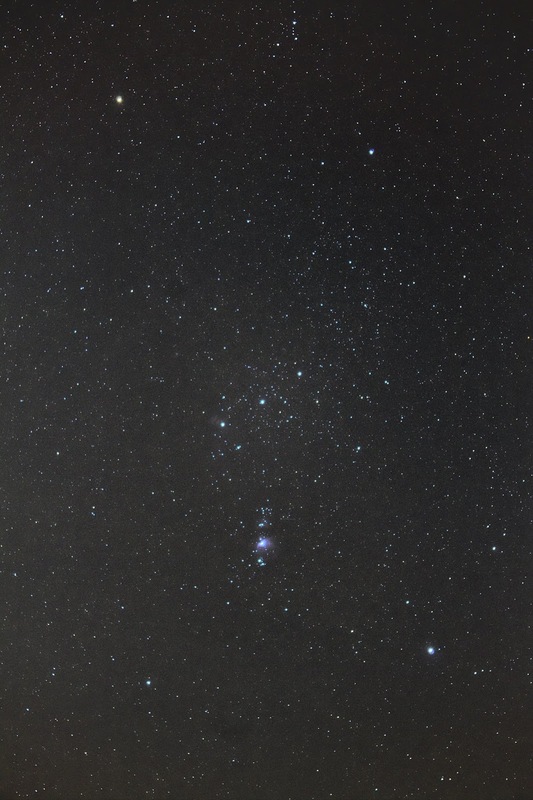 It's the Orion's Sword, three stars below Orion's Belt. From this photo you can see there's a bit more than three of them. The one on left is the top one on the sky. 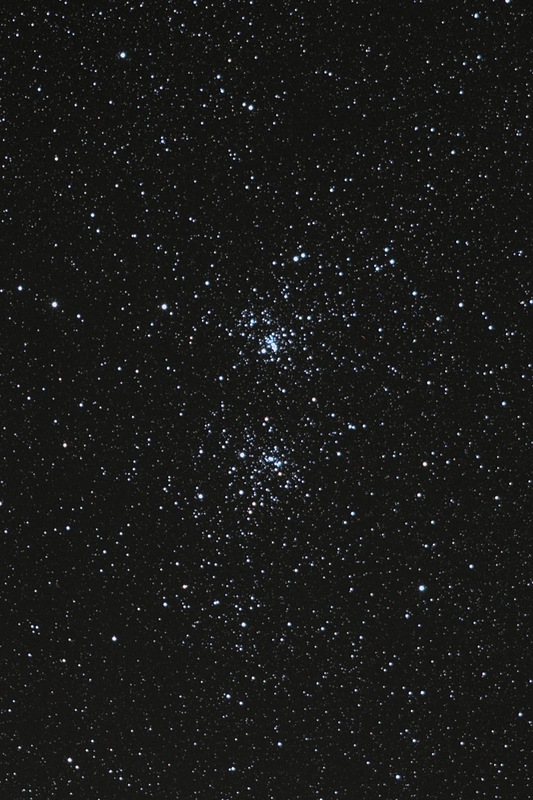 Now just imagine if you could see all those galaxies and nebulae with your naked eye. 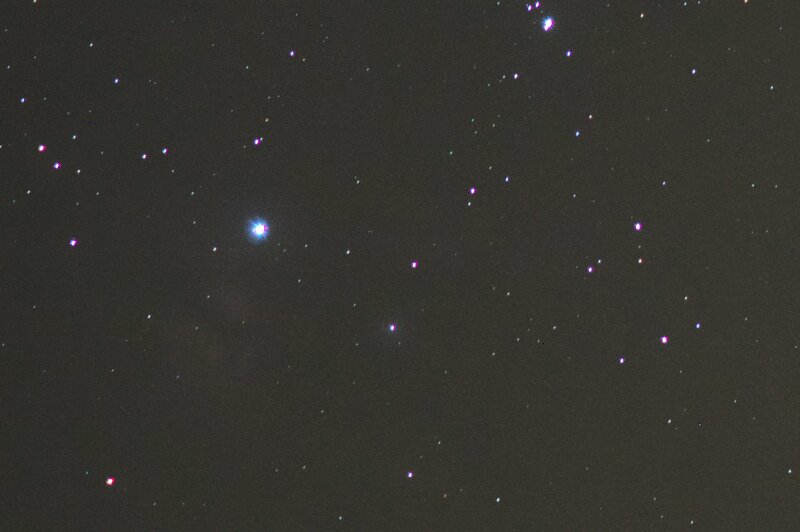 I still don't know much of the capabilities of my astrophotography set. As I've written before, I'm doing this on quite a tight budget. Partially my reason for this is that I see no point on buying expensive equipment that either I have no idea how to use (better cameras and lenses), or that does all the work on my behalf (goto-mounts). Of course you can get better photos that way, but where's the challenge? My plan is to learn things while doing this and getting better equipment when I definitely know what I need. Last thing I bought is a better lens: Canon EF 200mm f/2.8L II USM. After some testing this looks like a good buy. Difference in my Andromeda photos were quite dramatic. 200/2.8L collects so much more light than my old EF 75-300mm f/4-5.6 III. Of course I started wondering how much better photos do I get from all the other objects I've already tried with my old lens. 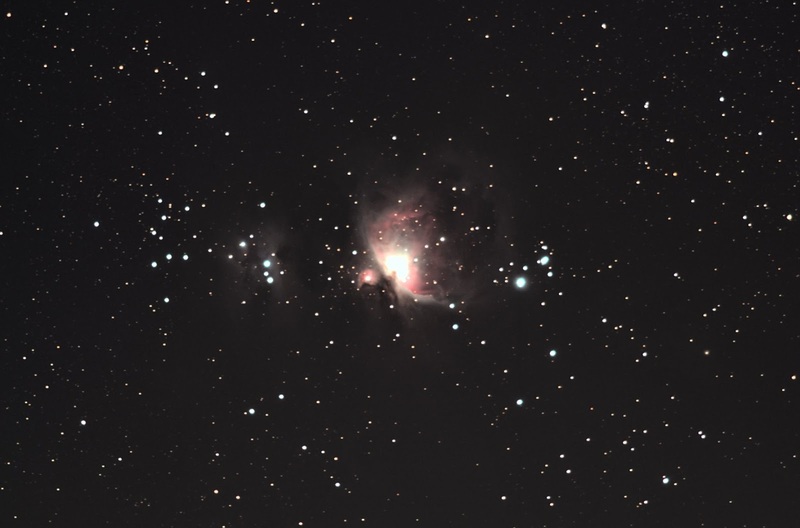 First thing that came to mind was Orion and M42. 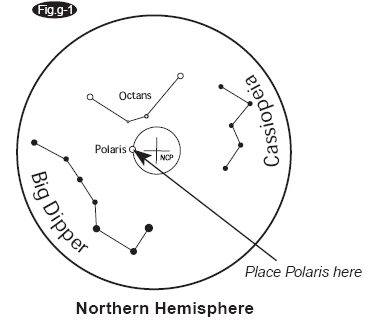 An awesome constellation for an amateur astrophotographer because there are so many different objects, some easy to see, some more and more difficult to even catch on camera. One of the most fascinating objects to me is the Horsehead Nebula (Barnard 33) and I tried to photograph it as soon as I could. My first try was with the 75-300mm lens, and it was a disappointment. As you can see, no Horsehead even with a good imagination. Flame Nebula (which I was totally unaware of before this) can be seen somehow if you stretch the image to it's limits. The next ones are taken later that year with a better lens. Here the Flame Nebula can be seen without extensive stretching and even the colors are about right. It's a single photo I took in November just before sky was filled with clouds. No further testing was possible. I didn't see the Horsehead back then but know that I know exactly where it should be, and if I use enough imagination, I think I can see it. Nothing spectacular though. 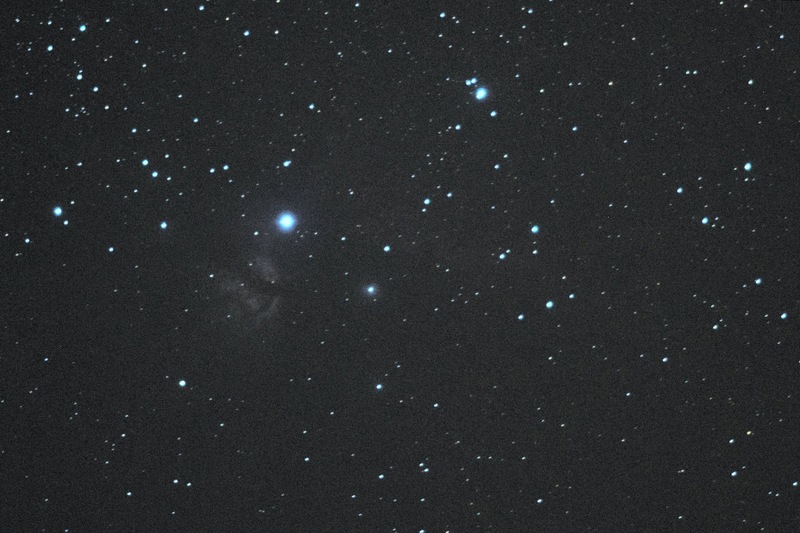 Flame Nebula and Horsehead Nebula taken with EF 200mm f/2.8L II USM, at 2013-12-30. 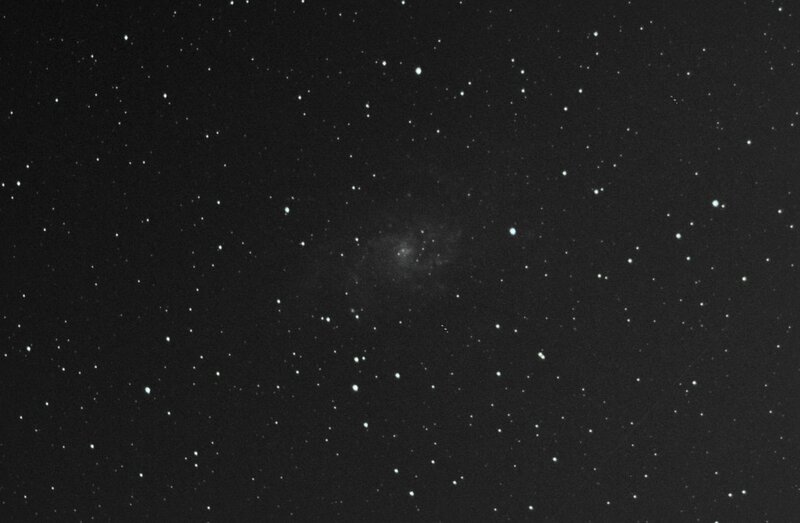 20x30s exposure stacked with IRIS, postprocessing with Darktable. 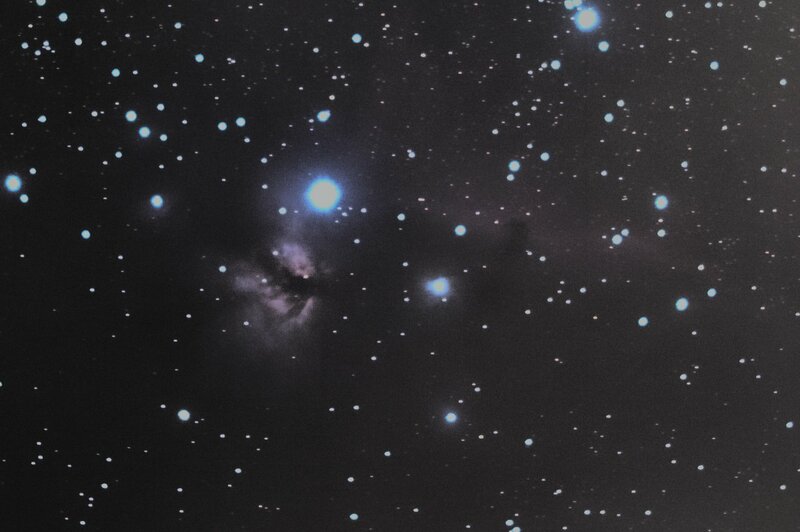 Horsehead is easily visible. Mission accomplished. The Flame Nebula took me by a surprise. For some reason I wasn't aware of that before I saw it in the photo. While stretching the colors on this photo I decided I'll learn how to shoot proper flat fields. The background is so difficult to fix in postprocessing. It even shows in this cropped image. I've concentrated too much on too small objects. 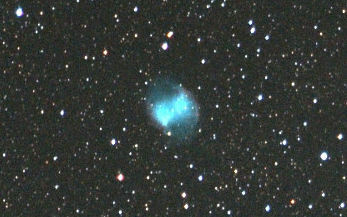 Images of larger scale can be nice too and one can more easily use longer exposures. Too bad I don't have a good camera lens for that. Only the one that came with the camera. 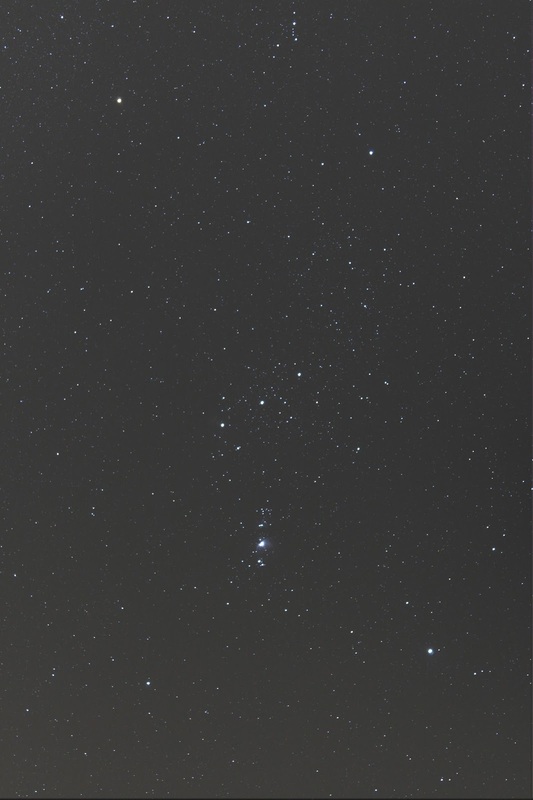 I set it to 55 mm and tried to fit as much Orion as possible on screen. 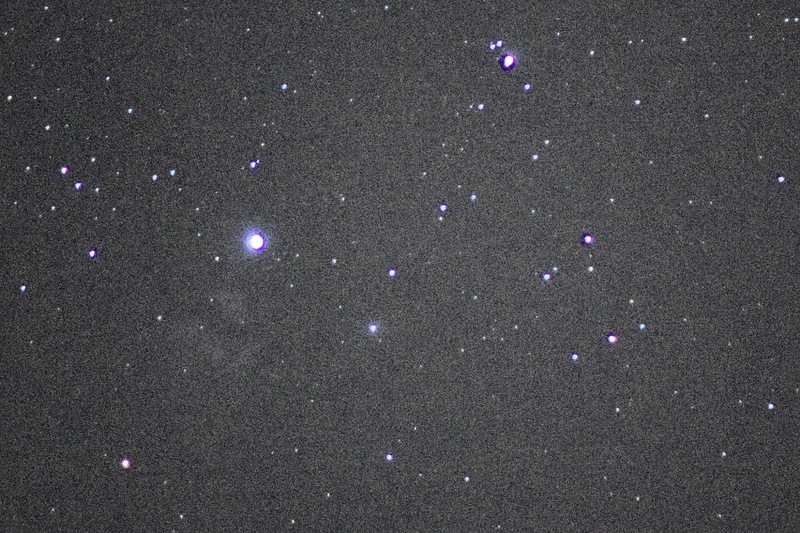 I also took series of photos, 10x30 seconds, and stacked them with IRIS. Total exposure is more than 3 times of the one above, but I think I still like the single shot more. I'll better prepare my camera control set before the next clear sky. 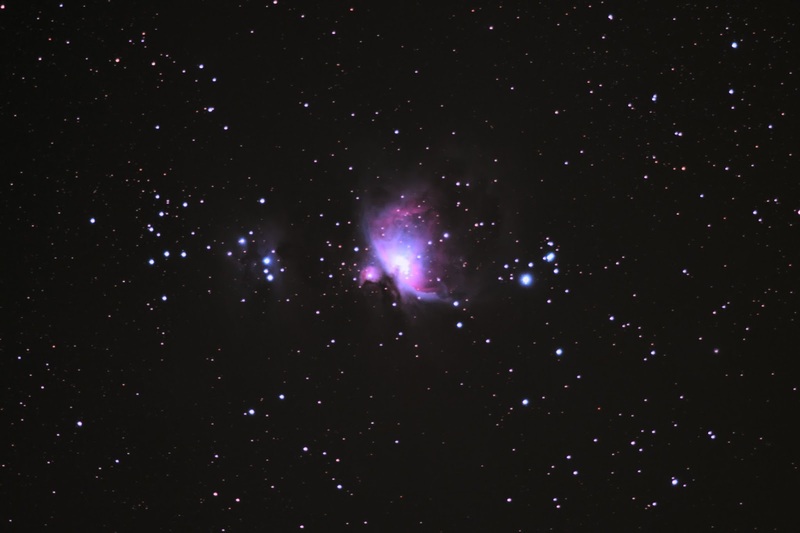 I also took more shots of the Orion Nebula M42. I've photographed this a lot in the past, but of course my skills get better and sometimes my equipment too. This time I tried stacking with Regim instead of IRIS. Level of visible details looks better than any of my photos before. Colors on the other hand are a bit wrong. I think what's green there should be blue. I'll have to try IRIS for the stacking as well. Looks like Regim used the wrong Bayer matrix for my raw photos. When I manually set the correct one, the colors look the way they should look. ...more or less. I'd still like some blue there. Even the single shots show some blue, so it's kind of strange the stack doesn't. The same again, but now with IRIS. Finally I got the blue color I missed. Lately several of my astrophotos have had some sort of lens flares or other reflections. I've figured that they're from street lights or yard lights. After all I do most of my observations and photographs on my backyard. Usually these flares appear on the edge of photo so I won't have to worry about them. Couple of times they have surprised me though. 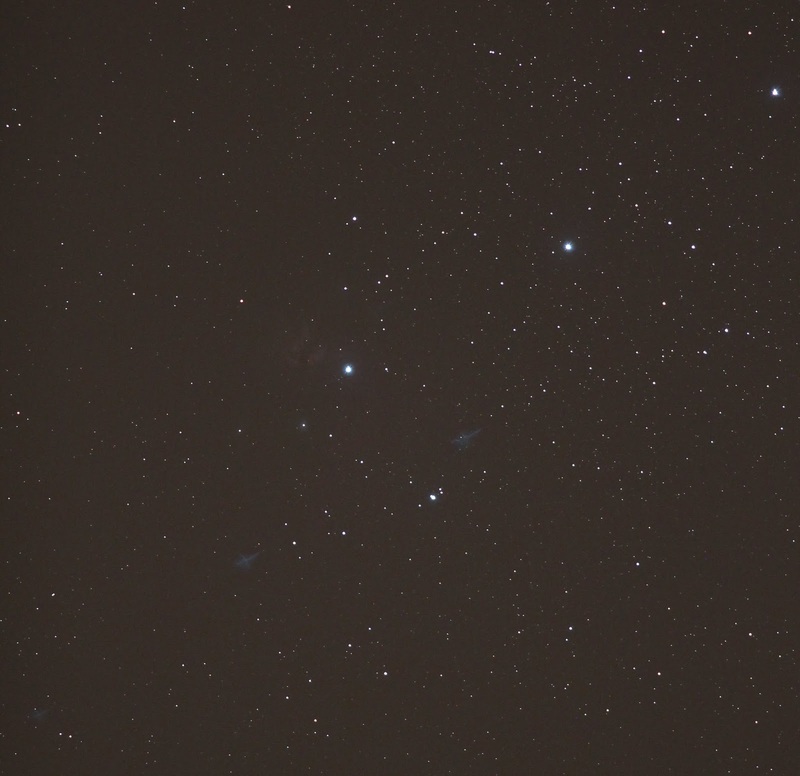 I was taking a panorama of Cassiopeia. 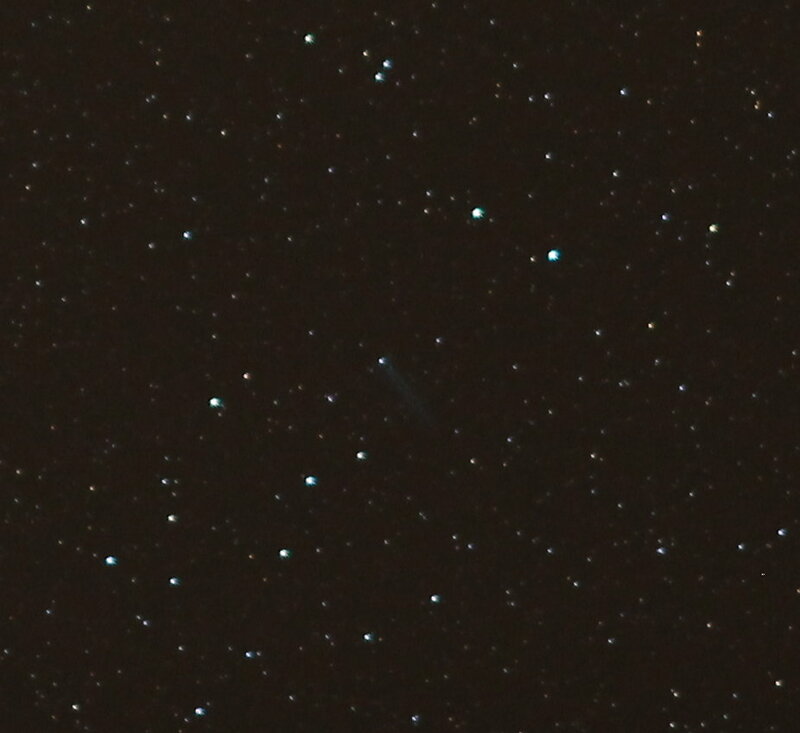 That panorama didn't work (not enough overlapping), but there was this "comet" on one of the images. I immediately checked the other images as well and realized what this was. There's a star in a very convenient place to make the flare look like comet's tail. 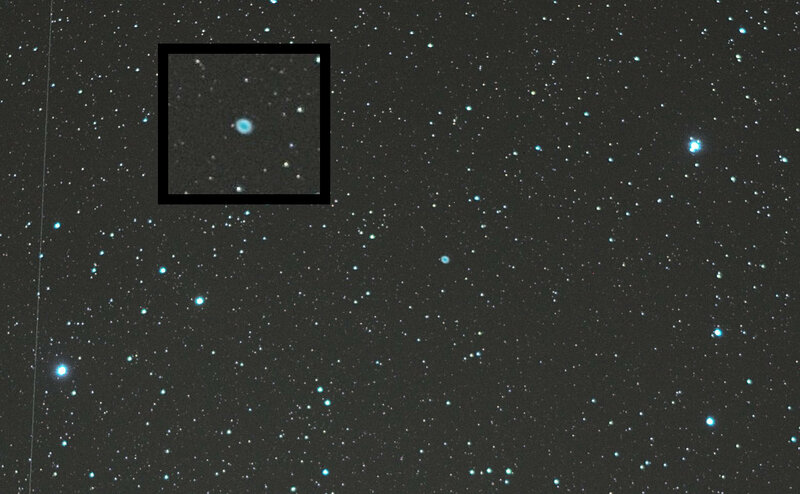 The next image had the same flare but the star had moved away from it. First of all, there shouldn't be anything like that on sky, at least on Orion. But now there's two identical! I was taking the photos on my balcony and there were some lights from neighbors that might find their way to my camera even though I had quite a long hood on the lens. I put some cardboard to block all light I could think of, but still the flares remained. I zoomed and looked the image thoroughly and I saw a third one. Then I got it. Those flares weren't from lights around me but from the stars. The next image (click it larger if the small one doesn't show) explains it quite well. There are three flares and three bright stars. 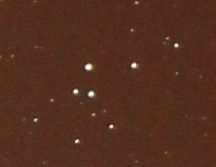 Moreover, the positions of the flares are exact π rotation of star positions. The flares were caused by UV-filter I had on the lens. I read somewhere that the filter does not affect anyhow on stellar photography so I've kept it on the lens to cover it. Looks like I have to remove it from now on. Without it there were no flares.